Anyone thinking of buying a new Volkswagen Passat or Tiguan can now choose from a variety of new efficient petrol engines. The popular Passat saloon and estate was previously only available as a diesel or petrol-electric hybrid. However, the decision to introduce petrol engines is expected to broaden the appeal of both models. Petrol options for the Passat range from a frugal 125PS 1.4-litre TSI to a potent 220PS two-litre TSI, via an impressive 1.4-litre unit with 150PS and Active Cylinder Technology – a feature which rests the engine’s cylinders when they’re not required, such as whilst in slow-moving traffic. In a first for the Passat, the sporty R-Line trim will be available with the entry-level 1.4-litre 125PS engine, making for a particularly attractive proposition for style- and budget-conscious buyers. The fleet market should be won over by the new petrol-powered Passat’s strong benefit-in-kind (BIK) numbers. Costing £23,775 on the road, the 1.4-litre 150PS SE Business six-speed manual reports a BIK rating of 22 per cent to a 40 per cent tax payer, which means a £6,880 company car tax bill over three years. 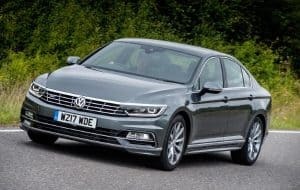 Wes Withey, Volkswagen UK’s product marketing manager, said that introducing petrol engines to the Passat family was “a great step forward”. Meanwhile, seven new petrol derivatives have joined the Tiguan’s engine range. The 1.4-litre 125 PS TSI 2WD has been added to the SE and SE Nav trim lines, while the accomplished 1.4-litre 150 PS 2WD DSG has been introduced to the SEL and R-Line trims.